I like Seinfeld a lot. Probably watched the whole series 2 times total. The show is filmed in front of an audience so the actors timing is affected by that. If it was not filmed in front of an audience the flow would have been different in that clip. The clip is also missing audio besides the laugh track (like when Elaine is "drumming" on the counter top) which makes it weird and sterile. Except he identifies as Jewish. "He said there were two mentors who raised him and who had a big influence on his life, and they were Jewish. He said, `I agree with the concepts and the religious beliefs of Judaism and I've adopted Judaism as my religion,"' Rubenstein said. "He really thinks of himself as Jewish." Pretending to be Jewish was probably the best thing he ever did for his career. ^ "Last week, crisis-management expert Howard Rubenstein acknowledged that Richards had shouted anti-Semitic remarks in an April standup comedy routine — well before his appearance earlier this month in which he harangued hecklers with the n-word." Quote: Jerry Seinfeld drew criticism earlier this month when it emerged that while in Israel to perform in Tel Aviv, the famous comedian visited an air force base and took his family to a tourist attraction in the occupied West Bank for ideological and military instruction. Caliber 3, the Israeli firm that runs what Israeli newspaper Haaretz calls an “anti-terror fantasy camp,” boasted about the Seinfeld family’s patronage in a Facebook post on 7 January. “Finally we are allowed to tell you!! 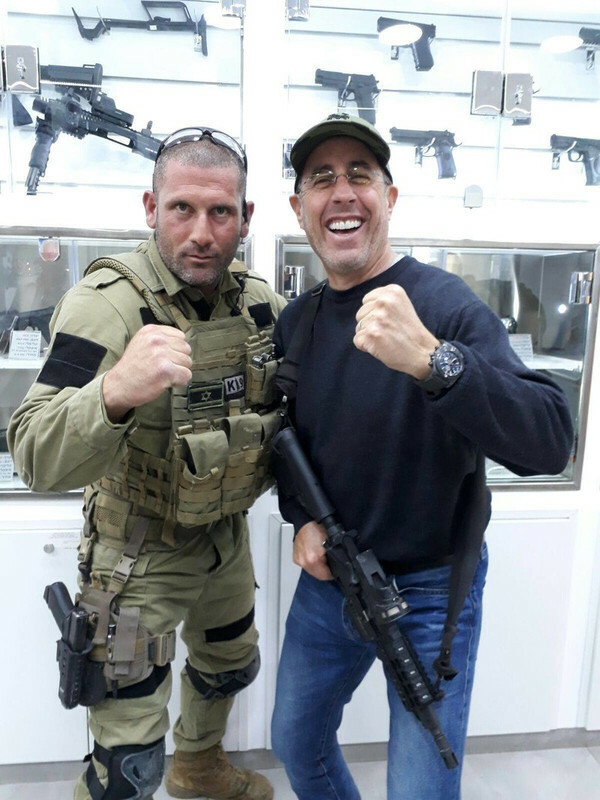 The legendary Jerry Seinfeld and his family were at Caliber 3 during their visit to Israel last week, they came to us for shooting training with displays of combat, Krav Maga [martial arts], assault dogs and lots of Zionism,” the post – which has since been deleted – said, according to Haaretz. Currently located in the settlement of Efrat, Caliber 3 says it was founded in 2002 by Colonel Sharon Gat and “works in close cooperation” with the Israeli army. Seinfeld was not the first high-profile American entertainer to receive Israeli military training-as-tourism.